If you found a bag full of cash, what would you do with it? A Washington state homeless man, Kevin Booth, was shocked to discover a paper bag full of cash outside the Sumner Food Ban, where he was waiting in line to receive food. “At first, I was like, what the heck is that lying on the ground?” Mr. Booth said in an interview with the local newspaper, the News Tribune. “Of course, I sniffed it to see if it was real. Then I was like, do I take off or do I stay?” Mr. Booth waited another twenty minutes for the Food Bank to open and then brought it to Anita Miller, the food bank director. Inside the bag was $17,000. Anita and Kevin called the police to see if there was an outstanding reason for the bag of cash and filed a report. How did Kevin Booth’s actions differ from what you would do with the money? What do you think of how he handled the bag of cash? What do you think would be difficult about that decision? If Kevin Booth kept the money, how do you think his life would be the same or different? 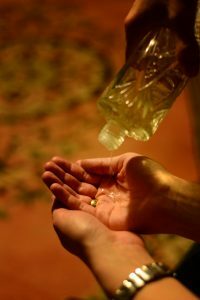 It seems, in Judas’ eyes, that Mary is squandering the ointment by using it on Jesus’ feet; that she is somehow wasting that precious gift by using it on dirty, sandy, grimy feet. No doubt this looks like an act of love and devotion to some and a waste of precious resources to others. If we’re honest this Lenten season, Mary’s act looks like the crucifixion, it looks like Jesus death. Jesus uses his life up, his precious giftedness to pour out his blood in the same way the precious ointment was poured out for feet. He takes us from our dirty, sandy, grimy lives and wipes them clean with his work on the cross. He squanders his life to bless ours, to free us from death and the grave. To some, like Mary and Martha, it looks like love and devotion. To others, like Judas, who just don’t see it yet, it looks like a waste of precious resources. This story foreshadows Jesus death on the cross and our freedom in the resurrection. It also points us to the neighbor, reminding us that we have the poor now and we get to “squander” and use our resources for them. How would you react if you saw someone using something expensive in what seemed like a wasteful way? What are some ways we waste our resources instead of helping the poor? Are there ways in which we can look at our lives and make changes to help the poor? Squander something. What is something you’ve been saving for a special occasion? Use that something to bless someone else. Blessed Savior, We thank you that you gave your whole life for us so that we can be free and to help our neighbors. Help us to see ways to bring your kingdom to earth in service of our neighbors. Forgive us when we err and guide us to care for the least, the lost, the lowest, and the lonely in our communities. Direct us to use our resources for others. In your name we pray, amen. « Previous Post: March 31, 2019–Party Time!